From Birmingham's founding through the end of the 1960s, Birmingham was a primary industrial center of the South. The pace of Birmingham's growth during the period from 1881 through 1920 earned its nicknames The Magic City and The Pittsburgh of the South. Much like Pittsburgh, Birmingham's major industries were iron and steel production, plus a major component of the railroading industry, where rails and railroad cars were both manufactured in Birmingham. In the field of railroading, the two primary hubs of railroading in the Deep South were nearby Atlanta and Birmingham, beginning in the 1860s and continuing through to the present day. The economy diversified during the later half of the twentieth century. Though the manufacturing industry maintains a strong presence in Birmingham, other businesses and industries such as banking, telecommunications, transportation, electrical power transmission, medical care, college education, and insurance have risen in stature. Mining in the Birmingham area is no longer a major industry with the exception of coal mining. Birmingham ranks as one of the most important business centers in the Southeastern United States and is also one of the largest banking centers in the United States. In addition, the Birmingham area serves as headquarters to one Fortune 50 company: Regions Financial. Five Fortune 1000 companies are headquartered in Birmingham. Homewood is a town rich in tradition, pride and Southern hospitalities, yet highly focused with a commitment to ensuring future success and progress for all of its citizens. Stop by for a visit and you will see why there is no better place to call home than Homewood, Alabama. Homewood's cultural life is rich and varied. The city has a first-rate public library and places a high priority on fine arts education and programs. Homewood's city park system rivals any place in the country with activities from a quiet walk surrounded by serene settings to a rousing game of soccer. Homewood's park system is hard to beat. The Spires of many churches, representing every denomination, reach to the heavens above. Homewood's faith community and citizens enjoy a relaxed atmosphere focused around togetherness, faith and progress. Welcome to Alan Battle's Riverside Marina, located on the beautiful Coosa River's Logan Martin Lake in Riverside, Alabama. We are a full service marina offering a boat launch, boat storage, boat repair, boating accessories, fishing tackle, used boat sales and more. Alan Battle's Riverside Marina is a short drive from Birmingham and within 2 hours of Atlanta. We are here to fulfill your recreational boating needs. Located on Lake Logan Martin's main channel, our year-round boat launch assures fishermen and pleasure boaters safety and convenience. The marina store is open every day and sells fishing licenses, tackle, water toys, boat parts and accessories as well as drinks and snacks. We are a small yet fast growing city located along I-20 about 15 miles east of Birmingham. During the past ten years the City of Moody has consistently been at or near the top of the list of the fastest growing cities in the state of Alabama. With a current population of 13,855, our citizens enjoy the benefits of a small town friendly atmosphere while being in close proximity to large city amenities. We believe in government that promotes both residential and responsible commercial growth. Moody is home to the state's first Miracle League ball field which is located in our state of the art park and recreation facility. Our schools serve all school aged children in nice newly built or refurbished educational facilities and we have a variety of medical services available to all citizens either within the city or a short twenty minute drive away. With excellent Library, Police, Senior, Fire and Public Works services, the city stands ready to serve you. Moody is now seeing a surge in the commercial growth needed to catch up to recent residential growth. The city possesses both large and small commercial properties having interstate and major highway visibility and/or access. As more people learn about our city, our progressive attitude toward growth and a warm small town atmosphere becomes apparent. During 2012 we will be celebrating our 50th anniversary as a city. I would like to encourage you to come visit our city and celebrate with us. I am proud to call Moody home and know that it is a great place to live, work and raise a family. If I can be of assistance, please do not hesitate to contact me. Jefferson County is the most densely populated county in the U.S. state of Alabama, the county seat being Birmingham. As of 2000 U.S. Census, the population of Jefferson County was 662,047. Jefferson County is the most populated and principal county in the Greater Birmingham area. Businesses find Shelby County equally as unique and attractive as the people who choose to live here. Areas such as the 390-acre Shelby West Corporate Park, is a sample of industrial developments that provide an increased economic benefit to our County. Our HistoryNative Americans fished and hunted along the Cahaba's banks long before the white man settled in North America. But with the surrender of Creek land in 1814, white settlers flowed into Alabama to build homes by its rivers and use the bounty of its fields and forests. Among them was Warren Truss, a North Carolinian. Truss settled in the area sometime before 1820, acquiring 1,000 acres of land and building a mill on the Cahaba. Soon the nearby settlement became know as "Truss". For several decades, Trussville was a rural, rather isolated community, and farming was the major occupation. Although the tiny hamlet sent a contingent of officers and men to fight for the Confederacy, the Civil War directly touched Trussville only toward the end of the conflict. According to Trussville Through the Years, by Carol and Earl Massey, Union Gen. John T. Croxton led a raiding party to Trussville early in 1865 to burn the Confederate storehouse. They succeeded, but the people of Trussville put out the fire and salvaged much of the burned grain and flour. Formal education was a little slow in coming to Trussville, although the literacy rate was above average for central Alabama in 1860. In 1869, Professor R. G. Hewitt founded Trussville Academy, a log structure housing 100 students. Hewitt made a lasting impression on the community. The middle school and high school in Trussville still carry his name. Railroad service came after the Civil War, opening up industrial development in the 1880s. During the last part of the 19th and the early 20th centuries, a furnace producing pig iron succeeded in Trussville under various ownerships. Envisioning a flourishing new city, a group of local residents organized the Trussville and Cahaba River Land Company. But the anticipated boom along the Cahaba never occurred. Instead, the city that succeeded from the iron and steel industry was Birmingham. During the Depression, part of the government's economic recovery program was to allocate land suitable for low-rent housing and part-time farms. One such location was to be in the Trussville area, but further investigation showed that the 615 acres of "Slag Heap Village" were unsuitable for farming. However, the land was suitable for suburban housing. Fired by the vision of project manager W. H. Kestler, the "Cahaba Project" went up, opening in April 1938. Homes were sturdily built, with indoor plumbing, running water, electricity and amenities rare at that time in much of Alabama. The project included 287 residential units - apartments, duplexes and single-family homes. The government also built a high school and cooperative store, interspersing the area with malls, sidewalks, paved streets and parks. Trussville children in the 50s, enjoyed an uncomplicated, small-town life. Children entertained themselves by walking up and down the street playing on the Mall, and swimming in the Cahaba. There was a library located in the commissary. Most families had only one car or no vehicle, but a bus went daily into Birmingham in the morning and came back that afternoon. A special charm of the Project today is the canopy of stately trees that lines Chalkville Road and adjacent streets. Many were planned in the 30s and 40s. Most of the Project was originally devoid of trees, because the area had been farmland before the government acquired it. The Project, like many modern subdivisions, had its own special entrance. The gazebo at the corner of Main Street and Parkway Drive, a long-time Trussville landmark, was part of such an entrance. On June 10, 1947, the town of Trussville was incorporated, absorbing both the Cahaba Village and "old Trussville." Early in 1948, the government deeded all park property to the town. Trussville grew, but quietly and fairly slowly in the 50s. General suburban sprawl and the completion of I-59 created more growth during the 60s and 70s. 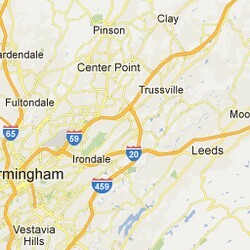 However, Trussville was still a well-kept secret. Like an adolescent in a growth spurt, the city expanded in all directions during a frenzied period in 1985. "It started when Birmingham was doing a lot of annexing. They tried to annex our new (Hewitt-Trussville) high school, which was less than a year old," says City Clerk Lynn Porter. Fired by this move, the late Charles Grover, then the mayor, and city council members announced their own plan and policy of annexation. From mid-May through the end of the year, the council held annexation meetings several times weekly. Frequent annexation continued into 1987. When the dust settled, Trussville had tripled its land mass and doubled its population. Things haven't slowed down since. From 3,500 residents shown in the 1980 census, Trussville's population has grown to about 12,500 in 2000. This growth is expected to continue at a fast clip. Attracted by good schools, a safe environment and friendly atmosphere, Trussville has become a drawing card for young, middle-income families. Many have gravitated to older homes in the Cahaba Project, often upgrading or remodeling them. Numerous subdivisions and residential areas have also sprung up within its boundaries. The city now extends from I-459 northward to the Jefferson County line, and takes in a sizable area west of I-59. To meet the needs of Trussville's growth, restaurants, retail and service establishments (including two major shopping centers built in 2000) have sprung up. A major, 120-acre complex for youth sports was completed in the mid-1990s. 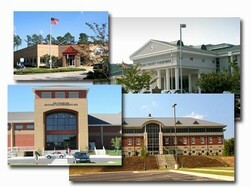 The public library completed a major expansion in 1997, and a senior citizens activity center opened in 1999. Gene Melton, mayor of Trussville since 1996, says the city is facing the challenge of managing this growth, while maintaining its unique charm. "After all, one thing that attracts people to Trussville is its small-town atmosphere," he says. One approach to doing this involves the Cahaba-the city's long time symbol. A $2.2 million Greenways Project, funded in 2000, will heighten the river's role as the heart and soul of the community. Threading its way along the Cahaba from the sports complex through the downtown area, the lighted walking-biking trail will be more than two miles long. A pedestrian bridge will provide access to the library, community center and mall area. 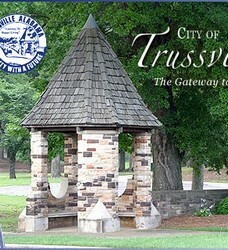 Long ago, Trussville adopted as its motto, "Gateway to happy living." For old-timers and newcomers, the motto still rings true. Acknoledgements: Much material came from Trussville Through the Years, by Carol and Earl Massey, and The Making of a City: Trussville, Alabama 1830-1970, by Douglas Claire Purcell. For further information, reference copies of the Massey's book are in the Trussville Public Library. Purcell's paper is on file in the Southern history sections at Birmingham's downtown library. Beautiful St. Clair County Welcomes You! Visit Logan Martin Lake for fun. St. Clair County, a county older than the state, was officially established in November, 1818 by the Second Territorial Legislature and was named after General Arthur St. Clair. Pell City is open for business. We are located on Interstate 20 in the vital Atlanta - Birmingham corridor. We are within easy reach of all the major markets in the Southeast. We have an outstanding industrial park and our Economic Development Council is ready to assist you in making your business plan work here. Our job training programs assure that our workforce is second to none. The quality of life here is about as good as it gets. Our climate is ideal. We are on the shores of beautiful Lake Logan Martin where lakefront living at reasonable prices is a reality. The quality of our health care system is evidenced by our new (December 2011) state of the art hospital, St Vincent's St Clair. Our educational system is a leader in our state.The recent addition of Jefferson State Community College (2005) provides wonderful educational opportunities for all our people (particularly in the health sciences where we are a leader in producing nurses). In 2004 we established our city as a cultural center in our state with the opening of the Pell City Center for Education and the Performing Arts which is home to a 400 seat state of the art theater complete with orchestra pit. Our Lakeside Park is home to our Civic Center with facilities for meetings large and small. Our thriving and growing tennis program is led by Sarah Stewart recently named Alabama's Professional of the Year. All youth sports are available and professionally managed by our outstanding staff. 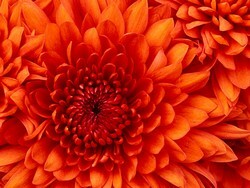 There are numerous classes offering opportuities for self improvement. Lakeside Park also has a beautiful walking trail, outdoor pavilions, an outstanding playground, fishing and boat launching. If you love golf, you'll love Pell City. Pine Harbor and the Pell City Golf Course are two attractive courses for your golfing pleasure. 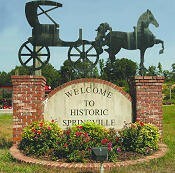 Springville, Alabama is located 30 miles northeast of Birmingham in St. Clair County. The city has a historic past, seen in its old homes and quaint shops and a dynamic future. Here you will find economic prosperity, a relaxing atmosphere, and community spirit. Whether you are a business owner, resident or a visitor, Springville offers something for you. The City of Leeds was incorporated in 1887 as the primary population center of an area known as the Cahaba Valley, a region of fertile bottomland nourished by the Cahaba and Little Cahaba rivers. At first, the War of 1812 and its politics brought families to the Cahaba Trail at Leeds. By 1820, the Cahaba Trail became a road and a major stagecoach route through three counties. The discovery of rich and valuable natural resources accelerated the region’s growth in the mid- to late-1800s. The discoveries of ore and minerals and the arrival of the railroads brought the Industrial Revolution to Leeds’ doorstep. In fact, as a newly incorporated city, Leeds was named for the noted industrial city of England where a bricklayer invented the Portland cement process.The mineral findings brought Leeds Standard Portland Cement Company as well as population growth to Leeds. 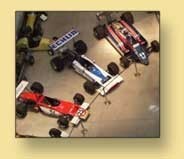 , Known today as Lehigh, this company has continuously operated since 1906.